DUBAI: Dozens of Islamophobic attacks are being recorded in London every week as the city faces a rising wave of hate crime, figures released exclusively to Arab News show. Police in the UK capital are stepping up measures to halt anti-Muslim attacks, and warn that a “vast number” of incidents is still going unreported. A total of 1,003 incidents of Islamophobia were reported in London between January and September last year — about 26 a week — compared with 1,662 incidents in 2017 and 1,224 in 2016, the figures show. In 2011, fewer than 320 incidents were reported. “Reports of Islamophobic hate crime are continuing to rise in London,” Det. Sgt. Tony Forsyth, of the Metropolitan Police, told Arab News. Islamophobia accounts for roughly a 10th of all racist and religious hate crimes. More than 12,350 hate crimes were reported in London in the eight months to September this year, compared with 16,995 in 2017. Forsyth said the rise in the number of incidents could be due partly to victims having more confidence in reporting crimes. However, he said that a string of terror attacks in wider Europe and across the UK, including the suicide bombing that killed 22 people following a concert by pop star Ariana Grande in Manchester in May 2017, followed by the London Bridge knife rampage that left eight dead — were also to blame. 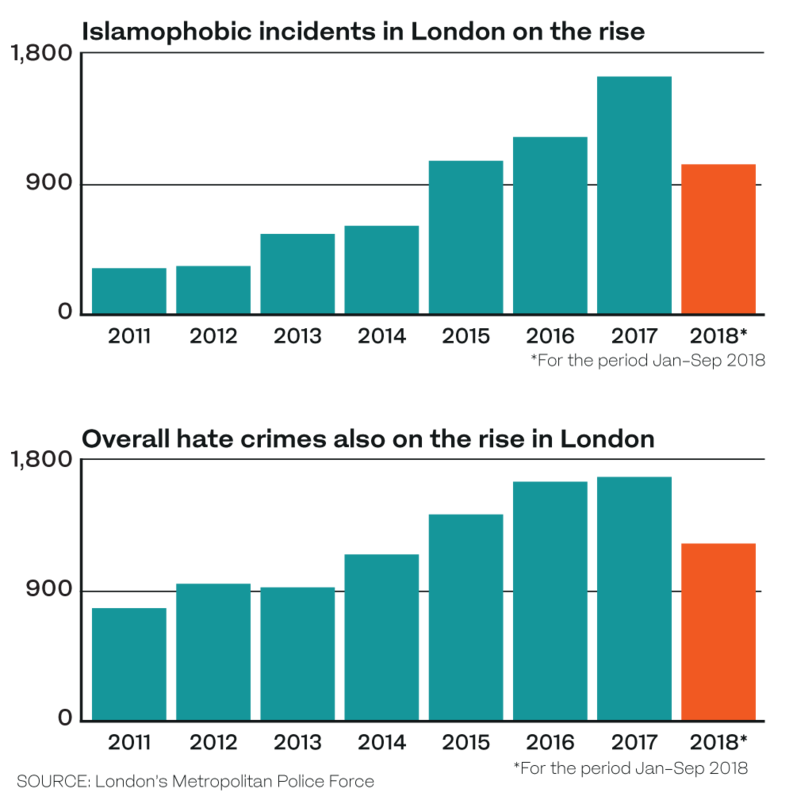 In 2005, in the aftermath of the July 7 London terror attacks, the number of Islamophobic incidents increased dramatically, with 44 incidents reported in the three months before the attacks compared with 365 in the following three months. However, Forsyth said the police force and its 30,000 officers were taking extra measures to reduce the number of Islamophobic and racially motivated hate crime across the capital, and give victims the further confidence to report attacks in their neighborhoods and communities. “Where more people are reporting hate crimes, it helps us identify where and when the crime is taking place and who the repeat offenders are,” he said. In London, the most commonly recorded hate crime in relation to “faith hate matters” is violence against a person, which can range from common assault to more serious attacks, said Forsyth. Public order offenses and criminal damage, such as vandals daubing a mosque with graffiti, are also among racially motivated crimes reported to police. Police have developed close links with third-party reporting groups, such as TruVision, Tell MAMA, Galop and CST, in order to gain a fuller understanding of hate crime and the extent of under-reporting. A widely publicized example of the rise of Islamophobia was “Punish a Muslim Day,” when letters were sent encouraging recipients to carry out violent acts against Muslims in a malicious advert circulated in London and other UK cities. Forsyth said police and the UK’s North-East Counter-Terrorism Unit investigated the incident and worked with local community and faith organizations across London to reassure communities in the wake of the adverts. Given the rise in figures, Forsyth said police were ramping up efforts to stem the growing tide of Islamophobia across the UK capital. The Met Online Hate Crime Hub, for example, is a cadre of officers who investigate online hate cases with key partners, including social media providers, victim support organizations, academic experts, and online and social media data analysts. The MAMA (Measuring Anti-Muslim Attacks) project, also known as Tell MAMA, is an NGO that monitors anti-Muslim activity in the UK and acts as an independent third-party reporting service for those who have experienced Islamophobic abuse, discrimination or violence. In its 2017 annual report, the organization said that it had received 1,201 verified accounts of anti-Muslim hatred, with 3,005 incidents reported in the past three years. The report found that 70 percent of incidents last year took place offline and just over half of those involved cases of abusive behavior, with physical attacks accounting for nearly 20 percent. “It is concerning that in 2017 there was a 56 percent increase in incidents involving discrimination and an 88 percent increase in vandalism,” Hopkins said. Most incidents of anti-Muslim hatred took place in public areas and transport networks. However, in 2017, 12 percent of hate crimes took place in or near private property or households — a 26 percent increase year-on-year. The report found that most victims of anti-Muslim hatred were women and most of the perpetrators were male. According to Tell Mama’s latest report, the most widely reported anti-Muslim hate incident was abusive behavior, followed by physical attacks. The group also saw a temporary spike in online reports in March and April 2018, following the “Punish A Muslim Day” campaign. Iman Atta, director of Tell MAMA, said that Muslim women were most at risk of Islamophobic attacks. “Every year since 2012, most victims of street-based hate crimes have been women,” she said. Shahid Malik, chair of the organization, said that the rise in anti-Muslim hate “affects lives, families, communities and, ultimately, the safety of our entire country.